The Norwegian band Wardruna recently performed at an Oregon event called Faerieworlds, a three-day art and music festival focused on mythology and folklore. The band played their first show in the United States last year at the same event. American audiences will soon get more chances to see lead man Einar Selvik and related projects as Einar will perform solo in New York on December 9 and 10 along with Enslaved and Einar and Ivar Bjørnson’s project, Skuggsjá, which was released through Season of Mist in early 2016. While at Faerieworlds, Einar gave two workshops on rune lore, which focused on understanding and evaluating the sources of rune knowledge and how to “activate” them through intention and sound, which is one of the key concepts of Wardruna. While speaking at the workshop, Einar moved almost continuously, pacing back and forth in front of the attendees. He later said that he thinks best when he is in motion, particularly walking, and that most of his song ideas come to him while he’s out walking in the countryside. He speaks thoughtfully, leaving plenty of space for personal interpretation–when speaking about runes he doesn’t tell you how things are, but rather how they can be. After the Saturday workshop, Einar and I got to talk about Wardruna’s new album, Ragnarok, out October 21, and Skuggsjá, a special project for the 200th anniversary of Norway’s constitution. Ragnarok represents the conclusion of the trilogy of rune explorations Wardruna started with Gap Var Ginnunga in 2009 and Yggdrasil in 2013. Listen to the new track, “Odal,” below. So far we’ve only heard one song, “Odal,” from the new album. It’s the one with your children on it. How old are your children? My son is 13 and my daughter is 9. Were they interested in being on the song or did you have to talk them into it? ​How are you going about teaching them about understanding the runes and their meaning? Is that something that’s part of your daily life? No. I think those things need to come naturally. If they’re interested, if they have questions, they know they can ask me and they know I love to talk about these things. When they ask me, and sometimes they do, it’s on their initiative and that’s when you can teach them something. I don’t want to push it on them. If they show interest then it’s there. Yeah. Sometimes they think it’s utterly boring and my son, I think he would prefer if I did some more metal things. He’s more into that. Well, you have the Enslaved collaboration so that’s not too far off from metal. On another new song, “Wunjo,” you have a children’s choir. You’re used to bringing in instrumentation like rocks and trees and things like that and then here you have a choir of children’s voices. That’s got to be different than a typical Wardruna recording session. First of all I think it’s a very strong expression. The purity of a child’s voice does something and contains something that is very expressive and so it was only a joyful experience. It relates to what you were saying in the workshop about having intention and speaking and activating the power of runes. Yes. And ​having children . . . the effect and impact of using a child’s voice for expressing serious matters, I think it enhances it enormously. So when you have children singing about what rises from the ashes and limitless feelings and stuff like that, I’m really happy with the results. And you started your family right about the time that Wardruna was just getting started. Yes, it was about the same time. My son was in the belly when the first recordings were done. I saw on the track list that you use ice percussion on Ragnarok. I’m curious about that. How does ice work as an instrument? There is in Norway a musician who is widely known for playing on ice, like making instruments, making horns, like xylophones and things like tuning up ice. But you need to have very dense ice so some ice has been taken from ice-age glaciers. and also some certain waters up in the mountains they freeze slowly enough to not have much air. So the ice is in columns? Yeah, they’re basically shaped ice columns. Is it difficult to get sounds from that? I wanted their sound so they are the boss, I am the instrument. They set the rules. I wanted their sound. I didn’t want them to sound in any way. What other natural instruments did you use on this album? On this album, I think that’s the most prominent. I used some trees. I normally always use trees. I love the sound. Why did you choose the runes for this album? What’s the meaning behind why you chose these runes and saved them for last? Everything was decided before any of the recordings were done. I chose to follow a certain order for different reasons. I chose to follow a different system, one could say, because there is a system behind it. I’m not going to share the details of that but it just made more sense to do it that way. If I wanted to tell the story of the three families in the normal order of separating them that would be a different story. Right, it doesn’t follow the order. No. I had my intentions and vision, or we had, when the concept was sort of chiseled and so that was decided first. Definitely for specific reasons. I saw on the credits that Gaahl is not listed. Are you still collaborating with him in any way? ​N​ot on this album but we​’​re definitely go​ing to​ do more things together ​I​ think. ​T​here​’​s no specific reason for him not being a part of it just t​hat​ it hasn​’​t bee​n a logical thing to d​o​ at this p​oin​t​. H​e has been v​e​ry busy w​ith​ his things and ​I​ have been ​​very busy with my things and at this p​oin​t we also live on opposites sides of the country​. So at some p​oin​t maybe​. That door is always open if we feel that​’​s appropriate. N​orway’s ​N​orse history for the 200​-year anniversary of the ​N​orwegian constitution. ​S​o it was basically started off as a one​-​off live piece. ​W​hen they asked me they said​,​ do ​yo​u want to write this piece together w​ith​ ​I​var and vice versa​,​ so we were asked together but separately. ​Y​eah​,​ well​,​ it wasn​’​t the gov​ernment who decided​. T​he idea didn​’​t come from them but they kicked on it​,​ they liked the idea. ​I​t was cool also b​ecause I​​ said, because I’m not a big fan of the Norwegian constitution and the state of Norway, at least not some aspects of it, so my answer was basically yes, if I’m allowed to criticize the constitution, then definitely I’m interested in doing it. And they did want to do it in that spirit of freedom of speech, so yeah, it was a nice recognition, you could say. What are some of your criticisms of the constitution? Well, mainly us being a christian country. and all that that includes. Politics and religion have no place together in the modern society. And there are many things surrounding that which are ancient and fucked up. So it’s more in terms of religious freedom but also we wanted to address things regarding truth and truth in how history has been told, which is a very central thing in the whole album. We address history, we mirror ourselves as a people, as humans through the eyes of history and how it’s been portrayed and whether that’s correct or not. Very often you see it’s politically motivated, what truth you decide to go with. I see Warduna’s music as dark in theme and tone. Do you see the runes themselves as dark or is that your musical history and experience coming out? It’s interesting that you say that. I actually don’t see it as dark music. Or, I see it as just as much light as dark. I believe in the balance of things and I believe in the importance of balance. The importance of darkness is there, of something wild. Some people might perceive wild for dark. Dark but not scary. But yeah, I don’t know, coming from Scandinavia the whole musical tradition is very dark, it’s very melancholic, so for me it’s more beautiful than sad or dark. 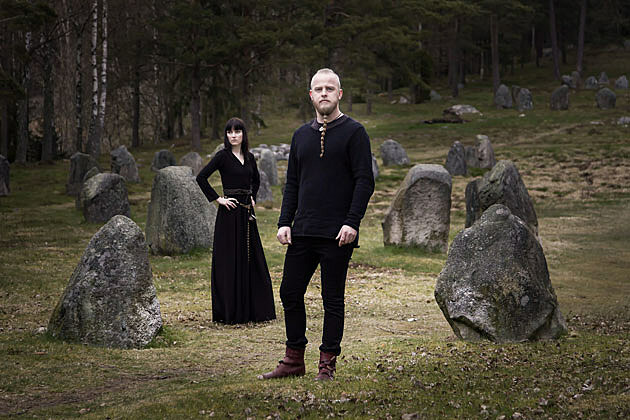 Now that you’ve reached the end of the trilogy what’s next for Wardruna? Will you continue in this same musical vein? Yeah, absolutely. I feel that I’ve just started, so definitely there are a lot of things I want to do with Wardruna in time to come. Like what? [laughing] There are so many. It’s about, sort of, displaying something old in a new way and there are many, many, many things from the past that I think is relevant enough to give voice to again. And also I do a lot of solo things these days and at some point I definitely want to make a more acoustic-based record. But what comes next I haven’t decided. You seem to be doing more collaborations lately. You have a collaboration with Faun. That was a, I don’t know, I liked the song. I liked the ideas that it sort of brought. I very often get asked if I want to play on a song, by small and big bands, and that really doesn’t matter whether it’s something very well established or not. Most of the time I say no, not because I don’t like it necessarily. It’s more that, in terms of art, I don’t compromise. And if I am to do a collaboration it comes down to whether or not I can see myself within that song or not. So sometimes if it’s the right song or if I have time for it and I like the song or feel like I’m connected or see myself in it then it’s interesting to do stuff like that. I read an old interview where you said you were surprised that metalheads seem to like Wardruna so much. Why does that surprise you? I wouldn’t limit it to metalheads. But I don’t know, I think I was surprised because I didn’t do it for anybody else than myself. I just had a really intense and strong need to do it for my own sake. So when it got released, or the first time I even posted anything of it online and the response was so overwhelmingly good, it surprised me because I hadn’t given it any thought really. I did think it might be too narrow. And it doesn’t really sound like anything else, so it could have gone both ways I guess. But I still feel that way, that I’m doing it for my own sake because I couldn’t not do it, so everything becomes a bonus. I am still overwhelmed by the fact that so many people have a very personal relationship, The fact that it can mean a lot to people, that’s quite overwhelming. It’s a bonus, a lovely bonus. Have you written any original music for the “Vikings” soundtrack? OK, I knew that some Wardruna songs had been used but I haven’t seen it because I don’t have television. Do you approach that differently? Yeah, of course. Well, both yes and no I would say. Sometimes where there is room for it I approach it a similar way. But because it is a different format, different needs, different time span then no. But yeah, I’ve written music and collaborated quite a lot with Trevor Morris who is the series’s main composer both on his music but also on some of the stuff I’ve written. And also in terms of if they have a ceremony or funerals or battle cries or drunken songs in the scene. I’ve also done quite a lot of that. I’ve been on camera two times as well and also performing on written music. I don’t watch it because I’ve seen it too many times. When I write for it I work with the specific scenes so I know it by heart. Many of the episodes, I know the lines and I’ve seen it too many times. And I have very little spare time so sitting at the TV, there is no time for that, very rarely. The new album was just announced a couple of weeks ago, it’s brand new. Yeah, I see that because of the title I think people are expecting it to be a very dark album. And I think that’s a very monotheistic way of viewing the term Ragnarok. It’s not an ending, it’s a transformation. Yeah, it’s just as much a beginning as it is an end. So I think it would be much less fruitful if I’m just about to focus on the end, on the wolf devouring the sun, on the brothers killing brothers, the war and all of that macho stuff, or, you know what I mean. When I read comments it seems people are expecting something dark and wolves and stuff like that and I think people might be surprised. Because for me, I think the most interesting part of the term Ragnarok is of course what rises from the ashes. Both parts are needed. I believe in balance, so there will be dark elements on the album but it’s about transformation. Yeah, I see that also and I don’t understand why. Why should it? I couldn’t not do this. I’m just getting started. Yeah, I see that now you have interpreted and conceptualized the runes so now you can use them, you can combine them, you can recreate them however you want. Yeah, and Wardruna is about much more than runes. It can be about anything and everything and you know, like I said in my talk, the word ‘rune’ even can have many meanings way beyond only their graphical structure. Rune means knowledge just as much as it means a sign, so the possibilities are endless. Runaljod – Ragnarok will be available in CD, vinyl and digital formats. Pre-order and special limited edition box sets are available now in both Europe and United States. Follow Wardruna on Facebook.